The Standard American Diet Will Destroy Your Good Health! The Standard American Diet or SAD is heavy on red meat, pork, foods made from dairy or cow's milk, processed foods laced with dangerous chemical preservatives, colorings, vitamins and flavor enhancers. The Standard American Diet is also made up of fried foods, foods cooked with high heat and microwaves, foods made with white refined sugar and flour or more and more today foods that contain high fructose corn syrup. This identifies only a few of the problems with the SAD diet. It also includes all kinds of fruit and vegetable juices whose nutritional value is destroyed by pasteurization...treatment with high heat that destroys all enzymes and most nutrients. Not to mention how many of these juices contain large amounts of added sugar, high fructose corn syrup or dangerous artificial chemical sweeteners and preservatives. Oh, yeah, and let's not forget that the Standard American Diet contains insufficient quantity and variety of fresh fruits and vegetables. What's The Biggest Thing Wrong With This Diet That Nobody Talks About At All? If you eat the Standard American Diet your body will be using up to 80 percent of its daily energy supply to digest that food. You read that right, up to 80 percent. You may have heard that the body is capable of healing and regenerating itself. Many of you have heard that all the cells in your body are totally replaced every seven years. This is true, but only if your body has the energy and building materials (nutrition) to do it. Let’s dig deeper into this issue. When you eat food it takes a lot of the body’s energy to digest that food, as I mentioned above. The heavier and harder to digest that food is, the more time and energy it takes for your body to digest and get rid of the non-nutritious and toxic waste products. Your body has a set of priority instructions. You must have food for nutrition (building blocks of structures and sources of energy) to provide more energy to replace that which has been spent. Your body’s next priority is to digest that food and get all the good stuff out of it that it can and get the rest of the unusable stuff out of the body before it putrefies and turns toxic. Just like the food scraps you put into the garbage turns fowl smelling and toxic. It just has to get the potentially toxic stuff out, before it turns poisonous or your body will literally die trying. If your body can’t digest, extract energy and eliminate the toxic stuff, you will die. So if you are eating all that hard to digest and eliminate food, how much energy do you think your body will have to repair and heal itself? It will not have enough to do the job. Is it possible that this is one of the main reasons why there are so many people with chronic or degenerative diseases in this country? I know it is. But...Don’t We Have The Best Food And Diet In The World? Doesn’t the food industry tell us that every day? Yes, they do. Just like the health insurance companies and others who thrived on the health care system before the recent health care reforms tried to shout down all evidence to the contrary that we have the best health care and health care delivery system in the world. The truth is we do not. Do we in fact have the best diet and nutrition if it takes nearly all our daily energy to process it and leaves nothing or next to nothing for maintenance and repair functions? No we do not. The Standard American Diet which is the product of the food industry will destroy your good health and create degenerative diseases. If you do only this, if you do nothing else...this will greatly improve your health and you will likely lose a few pounds as well. When you get up in the morning eat nothing but fruit in the morning, not canned fruit or frozen fruit, but real fresh fruit. You can either graze your way through the morning eating this or that fruit. Or you can do as I do and make a great fruit smoothie. All it takes is a cheap blender, fruit and some easy recipes. I've got recipes in my "Juicing for Health" portion of this website. In case you want to get started right now I’ll share my foundational recipe. My morning smoothie nearly always has the following in it. One banana, (Seriously I don’t want to insult anyone’s intelligence, but if you are a banana neophyte, unfamiliar with the demur but tasty banana, please take the peel off the banana. I promise you the peel won’t add one positive thing to the flavor of your smoothie. I want you to carefully wash off those fruits that can’t be peeled such as strawberries. I want you to peel those fruits such as apples, pears, peaches or plums that can be peeled as the skins are likely covered with nasty, poisonous chemical pesticides, fungicides and herbicides. Core any fruit like apples that have a core. In addition to the banana, I add a few strawberries when in season, pineapple when in season, peeled and cored apples and orange juice as liquid to make it the right consistency and give it great flavor. Just experiment to see what you like. 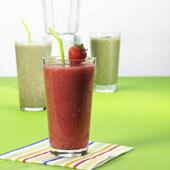 Why Eat Fruit or Drink Fruit Smoothies Until Afternoon Or 1 pm, Or Until You Really Feel Hungry? As I mentioned earlier the body has a digestive energy cycle in which your digestive energy is actually very low first thing in the morning and it doesn’t peak until noon or 1 pm or for some even later. What about breakfast being the most important meal of the day? Well it might be an important meal of the day, if you eat fruit or at eat lightly. Breakfast can be the worst meal of the day if you eat the Standard American Diet (SAD) recommended breakfast foods. Fruit requires almost no energy from the body to digest. It contains all the enzymes necessary to digest itself and benefit the rest of the body. As an aside let me briefly tell you what an enzyme is in case you don’t know. I don’t want to leave anyone behind. An enzyme is a particular and unique molecule that is essential in the activation and completion of a chemical chain of events like the digestive process. Without enzymes that come from food or which are produced by the Pancreas and liver primarily, nothing would happen in your small intestine where nutrients are extracted and absorbed into the body. The food would just pass right on through and you would die. Isn't Breakfast Supposed To Be The Most Important Meal Of The Day? Another implication of the first point is that breakfast should not be, contrary to conventional wisdom, the largest meal of the day. Actually, your midday meal should be the largest and most complex meal of the day since that is when your body makes available the most energy for digestive functions. Perhaps we should say all meals of the day are important meals if you do what makes sense for your body. These foods require the most energy to digest. They can make you feel very heavy and tired after eating them, especially if you are older than 40. Yes, for you younger people who might be reading this book, you gradually over time have less energy to work with every day. Ask anyone in their 40s or 50s or older who isn’t trying to appear younger and faking it. Another Problem With The Standard American Breakfast Is That It Is Too Acid Producing! What I call the Standard American Diet breakfast is also almost totally acid producing. It makes your body more acidic. Acidic bodies are bodies prone to internal inflammation and chronic diseases. Metaphorically and literally this causes you to kind of rust out, to seize up, to develop pain in your joints, to develop organ degeneration, circulatory system inflammation leading to circulatory system clogging - think Heart Attack, Stroke, Coronary Artery Disease, Osteoporosis, Arthritis both Osteo and Rheumatoid Arthritis, Chronic Fatigue Syndrome, Fibromyalgia, kidney failure, just to name a few of the problems that are directly related to eating these foods predominantly. Now I don’t want anyone to misinterpret what I am saying. I am not saying those foods are totally bad or should be banned, I am saying, as do all good nutritionists, eat more fruits and vegetables both of which tend to make the body more alkaline. Again, not to be misunderstood, you don’t want to be too alkaline either. But it is very rare for someone to be too Alkaline. But suffice it to say the body needs to be slightly Alkaline to be healthy and avoid the problems I mentioned above. Please click here to learn about "body pH" and the consequence of being too acidic. If You Eat Only Fresh Fruit In The Morning For Breakfast You Will Lose Weight....I Did And So Have Many Others! You will lose weight without struggle and without changing anything else unless all you eat is junk for the rest of the day. I’m 5 feet, 6 inches tall and a year and a half ago I weighed 215 lbs and had lost all hope of ever losing any weight because I was eating the SAD diet breakfast. Nothing worked. I just stayed the same and was tired all the time. I even woke in the morning not feeling rested. I started eating only fruit in the morning. Within three months of quitting the Standard American Diet breakfast I had lost 25 lbs. I didn’t even realize it until I had to put away my “fat pants” 40 inch waist pants and move down to 38 inch waist pants. My belly flattened out. There were some days when without thinking I ate fruit all day long just because I enjoyed the fruit so much. What Do I Recommend For The Main Meal Of The Day Around 1 to 3 PM! Now as soon as I feel hungry in the early afternoon, I eat my main meal of the day and take a high potency premium natural digestive enzyme capsule with this meal, because without the digestive enzymes, I still would feel some fatigue after eating. When I take the digestive enzyme I often feel no fatigue even eating a pasta dish or baked chicken with potato or sweet potato and vegetables. Degenerative or chronic disease does not have to be part of your future, if you take action now to learn better eating habits and make the appropriate changes in your life. It Truly Is Best To Eat Several Small Meals Each Day! Eating several small meals or snacks each day is better for your body than eating three big ones. Snacking between meals, as part of the several meals is good as long as those snacks are fruits or vegetables packed with nutrition. Of course if you stuff yourself each time you eat you are defeating the purpose and you will gain weight. But if you do eat more frequently you will never get ravenously hungry again. I can guarantee it, your body can guarantee it, you will have more energy, your body will better fight off disease, repair and renew itself, give you more energy to do the things you want to do with your life, if you learn about more healthy and effective eating habits and implement them. Dairy Or Cow's Milk Products Like Cheese Are Bad For You! Lest I forget to mention, for over 4,000 years practitioners of Oriental Medicine have said that dairy is not good for humans, pointing out that even cows don’t drink milk after they are weaned. People do not drink Mother's milk when the are grown and it was made of, by and for them, but only as infants. As you may know, Asians who live in Asia and the orient who eat as they have for thousands of years diets of mainly fruits and vegetables and only a little meat, don’t have heart disease and diabetes and other levels of degenerative disease at anything approaching the levels we have here, they also have very low obesity rates. It is also a fact that if they move to the West and adopt the Western or Standard American Diet, they get the same degenerative diseases we get at the same levels. So, our degenerative diseases are not due to genetic differences. They are nearly all due to dietary differences. Please click here to learn about the benefits of reducing dairy in your diet, unless you are following the path of the Holistic Medicine Detective...then skip this. If you are not sick and just want to ensure good health into the future, then I recommend that you don’t try to do it over night. I recommend that you don’t try to be perfect, because you will only beat yourself up when you are not. I recommend that you positively do not “do it over night” or it will be just another “diet” and you will likely fail at least in the long run. You don’t want another diet, what you want is a new way of eating. There is a very big difference in changing the way you eat and doing a “diet” to lose weight. Just do the best you can making these changes. Don’t get down on yourself. Just return to the principle of eating only fruit in the morning until you naturally feel hunger for something “heavier”. If You Are Sick Now...You Cannot Afford To Wait One More Day To Make These Changes! If you are not too sick you can make the changes more gradually and build the right new habits over time. But if you are really sick, you can’t wait even one more day and you will likely be highly motivated to make changes. Do you see why now is the time to do this, not later when irreparable damage has been done? It is possible, unfortunately, to wait too long until there is truly nothing to be done. If you are sick now and have high blood pressure, heart disease, cancer, gallbladder disease, arthritis, etc...here is what I want you to do now. Start Juicing For Health...Start juicing fresh fruits and vegetables. This is the most powerful and fastest way to regain your health that has ever been invented! Click here now to learn everything you need to know about Juicing For Health. If you are sick right now and are not exploring this website with the guidance of the Holistic Medicine Detective, then I'd advise you for your own good to look to the Navigation Bar on the Left. Find the section labeled Holistic Medicine Information and then locate the button labeled Holistic Med Detective, click on it and go through the material in the website in the order that makes it the most comprehensible and usable with the guidance of the Holistic Medicine Detective! If You Are Following On The Path Of The Holistic Medicine Detective, Please Skip The Following Detours Scroll Down Below To Our Familiar Images To Learn Where Your Next Clue Is. Learn Why Reducing And Even Eliminating Soft Drinks or Soda Pop From Your Diet Is So Important! Please click here to learn about the dangers of soft drinks or soda. Learn Why Reducing And Even Eliminating Your Consumption of White Sugar or White Refined Sugar Is Important To Your Health And How It Is Historically Linked To The Rise In Diabetes, Heart Disease And Cancer! If You Are Following The Path Of The Holistic Medicine Detective, Your Next Clue Is Below. Please click here to follow your next clue the danger of soft drinks and sodas. Please click here to return to the top of the Standard American Diet Page. Please click here to go from Standard American Diet to Unhealthy Foods! Please click here to go to or return to my Home Page Holistic Medicine Works!